◎Flagship of Esek Hopkins. Expedition to New Providence Island (6 killed), 17 Feb-7 Apr 1776. ↑Continental Ship Columbus. 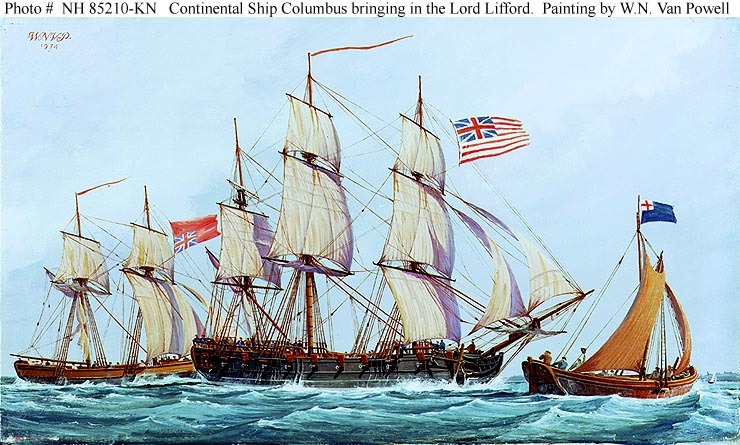 Painting in oils by W. Nowland Van Powell, depicting Columbus, under the command of Captain Abraham Whipple, bringing in the British brig Lord Lifford, while operating off the New England coast in 1776. Courtesy of the U.S. Navy Art Collection, Washington, D.C. Donation of the Memphis Council, U.S. Navy League, 1976. U.S. Naval Historical Center Photograph. ◎Expedition to New Providence Island, 17 Feb-7Apr 1776. Captured schr HMS Hawk, 6, 4 Apr 1776. 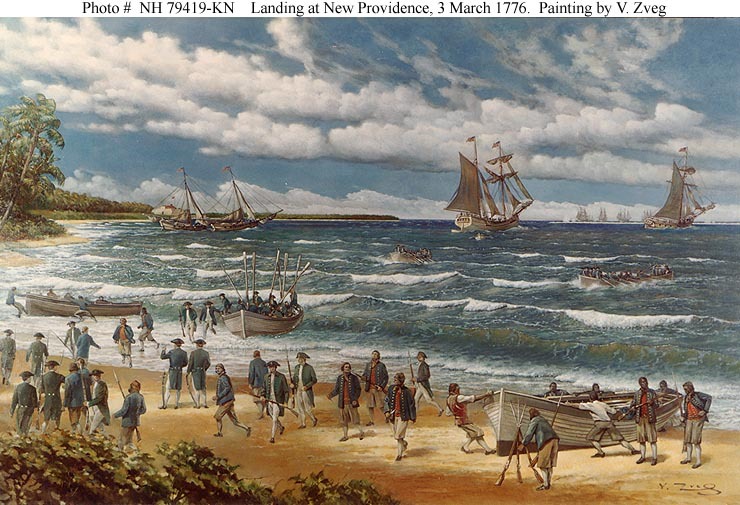 Chased ashore at Point Judith, Del., by British squadron and burned, 27 Mar 1778. ◎Expedition to New Providence Island, 17 Feb-7Apr 1776. Received first salute to an American flag at St. Eustatius, 16 Nov 1776. 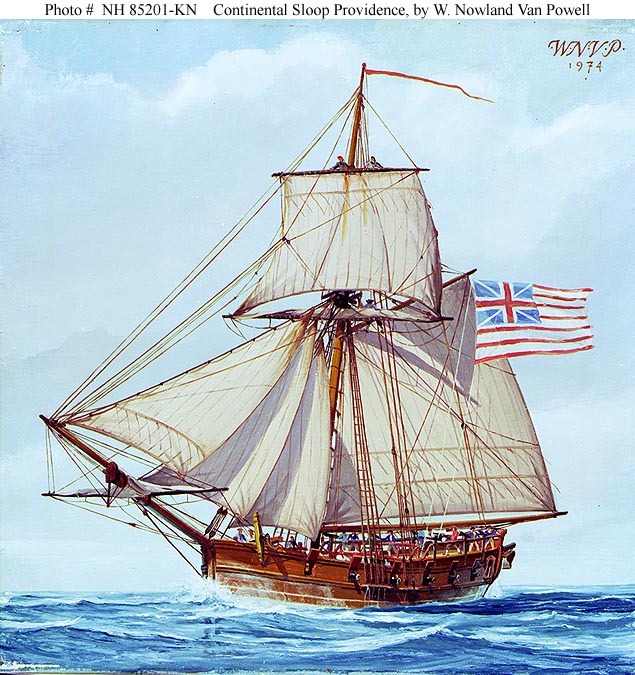 Captured sloop HMS Racehorse, 8, of Puerto Rico, (4 killd) Dec 1776. Defense of Delaware River, Oct-Nov 1777. Burned to prevent capture at Red Bank, N.J., 21 Nov (or 8 Jul) 1777. ◎Expedition to New Providence Island (4 killed), 17 Feb-7 Apr 1776. 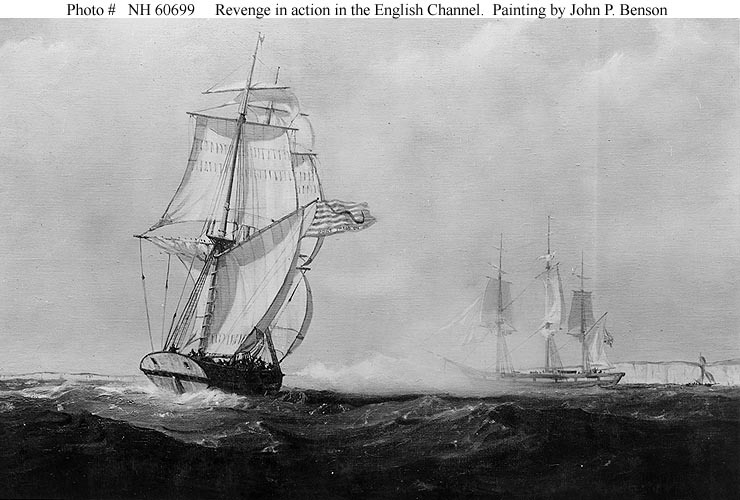 Damaged in action with HMS Glasgow, 20, of Block Island, Apr 1776. Forced ashore by HMS Milford, 32, off Nova Scotia, 3 (or 26) Mar 1777; captured. ↑Continental Sloop Providence. Painting in oils by W. Nowland Van Powell. Courtesy of the U.S. Navy Art Collection, Washington, D.C. Donation of the Memphis Council, U.S. Navy League, 1976. U.S. Naval Historical Center Photograph. ◎Expedition to New Providence Island, 17 Feb-7 Apr 1776. With Alfred, captured brigantine HMS Active, 10 Nov 1776. Ran blockade out of Narragansett Bay, Feb 1777. Attacked Fort Nassau, New Providence Island, 27 Jan 1778. Sailed under J. P. Jones until Sep 1776. Took brig HMS Diligent, 12, in action off Sandy Hook (4 killed), 7 May 1779. Expedition up Penobscot River, 25 Jul-14 Aug 1779. Destroyed (blown up) in Penobscot River to prevent capture, 14 Aug 1779. ◎Defense of Delaware River, Oct-Nov 1777. ◎Action with HMS Shark, 16, off St. Pierre, Martinique, 27 Jul 1776. Under Lambert Wickes, first Continental Navy ship to arive in Europe, bringing Benjamin Franklin to France, 29 Nov 1776. ◎John Barry, captain. Action against and captured sloop HMS Edward, 6, off Virginia Capes (2 killed), 7 Apr 1776. Captured by frigate HMS Pearl, 32, off Delaware Capes, 20 Dec 1776; later retaken by crew. Blockaded in Brittany, but ordered to leave and captured by HMS Alert, 10 off Ushant (7 killed), 19 Sep 1777. ◎With Hornet, was one of first two Continental Navy ships to go to sea, 14 Jan 1776. Expedition to New Providence Island, 17 Feb-7 Apr 1776. Defense of Delaware River, Oct-Nov 1777. ◎Under J. P. Jones, defeated HMS Serapis, 44, in action off Flamborough Head, 23 Sep, and sank as a result of damage (49 killed), 25 Sep 1779. During the battle, Jones said, "I have not yet begun to fight." ◎Commanded by J. P. Jones. Action with British privateer Triumph, 20, in Atlantic, Dec 1780. ↑Continental Cutter Revenge. In action in the English Channel while under the command of Captain Gustavus Gonyngham, 1777-1778. 1930s vintage photograph of a painting by John P. Benson, Kittery, Maine. Courtesy of Mrs. Alice Conyngham Gifford Johnson. U.S. Naval Historical Center Photograph. ◎Under Conyngham, conducted successful commerce raids. Captured a total of 60 British vessels and destroyed 33 during 1777. 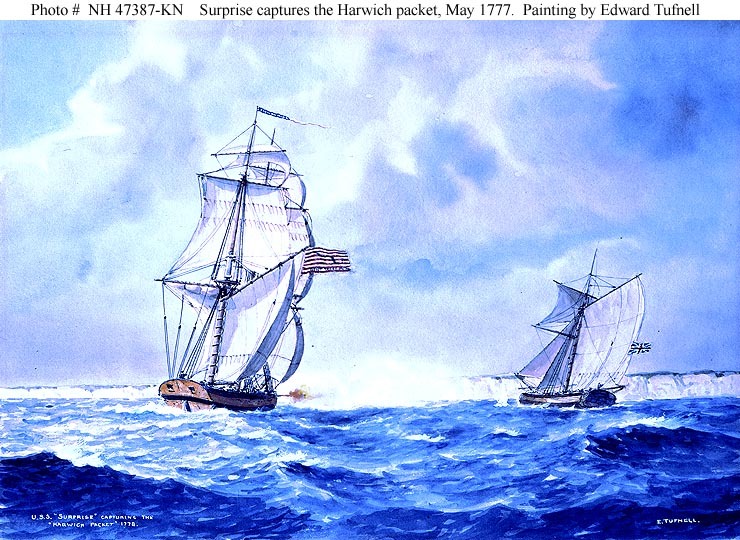 ↑Continental Lugger Surprise captures the Harwich Packet, 3-4 May 1777. Watercolor by Edward Tufnell. Artist's inscription in lower left cites the wrong year for this action, which actually took place in 1777. Courtesy of the U.S. Navy Art Collection, Washington, D.C. Donation of Commander Edward Tufnell, Royal Navy. U.S. Naval Historical Center Photograph.